Currently, Google Play Store Has Only One Tab That Is Divided Into Apps & Games And Movies, Music, Books Section. The New Design Separate These Section As Their Own Role And Add A Sub Menu For These Sections Which Is New Tab Bar. Now There Is A Home, Music, Games, Movies/TV Section In First Tab. The New Design Improves Navigation In Play Store, Everything Is Separate With Its Own Tab. Previously, Apps/Games Combined, Movies/Music/Books Combined. A New Navigation Tab Also Added Just Below Of Existing One, It Seems Every Label Has Its Own Sub Menu, For Example- When You’re In Home Section, You Can Navigate To Its Sub Section Like Editor’s Choice, Top Charts, For You, Categories, Early Acess And More. You’ve To Horizontal Scroll To See All Sub-Menus Or Options On Phone Screen. 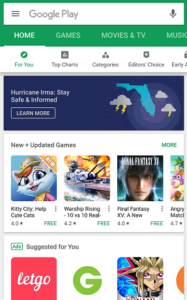 New Design Boycott Apps Section And Only Games Section Appears On Front Page. Apps Can Be Find Out From Home Tab. 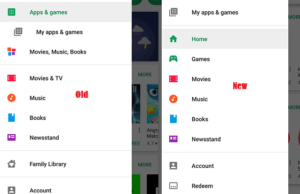 Another Change Is To Google Play Store’s Side Menu, Previously, Apps And Games Has “My Apps And Games” Sub Section And 2nd Main Option Is Of Movies, Music, And Books. Now, Only Sub Menu “My Apps And Games” Appears On 1st Rank, Apps And Games Divided Into Home And Games Option. Movies/Music/Books Section Boycott And Now Appears Separately As Movies, Music And Books. 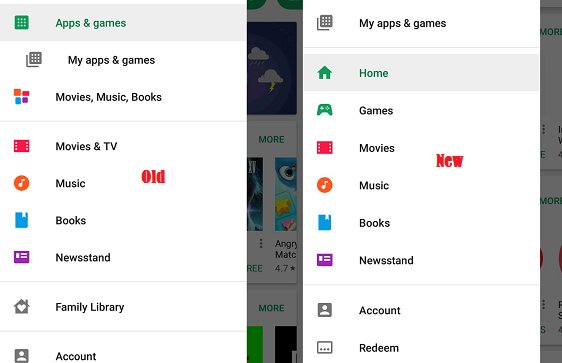 Highlights- Google Play Store New UI To Improve Navigation For What You’re Looking Separate Two Section Into Home, Games, Movies & TV, Music. A New Tab Is Also Added Just Below Of These Sections As Sub-Menu To Make It Easy For Users To Find Apps, Games Separately. Similarly With Movies & TV, Music Section. Left Side Menu Also Re Design For Better Navigation.